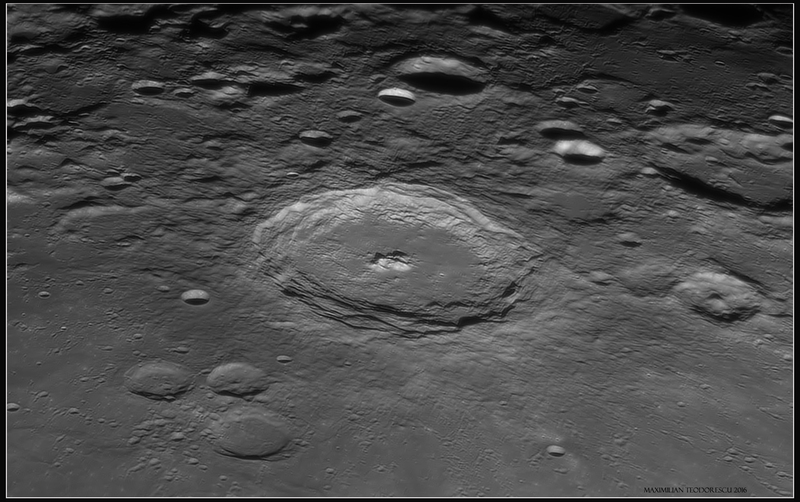 Being motivated by the previous lunar imaging session (with good to excellent seeing conditions) I’ve decided to force my luck and get to my imaging location yet another morning. 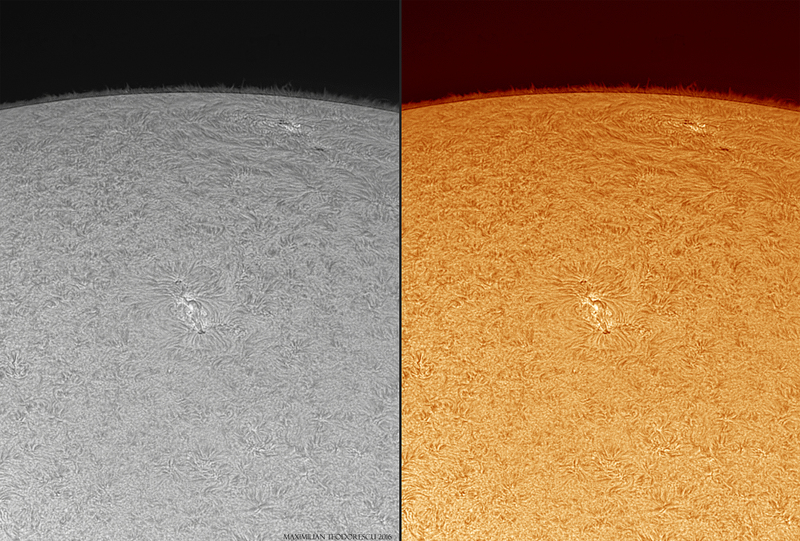 This time I had my brother-in-law to “confirm” the seeing conditions at the eyepiece. Same apparent conditions (fog, cold) but this time the excellent seeing conditions were present for only a few tens of seconds. Mostly, the value never exceeded 6/10. 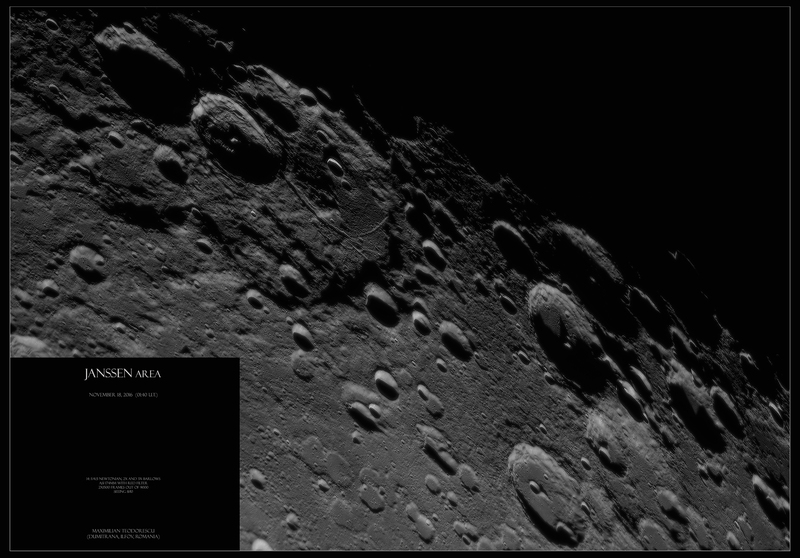 Yet, those very few 8-9/10 moments were enough to capture some of my very best lunar images to date, with details of 500 meters or less discernible in most shots. 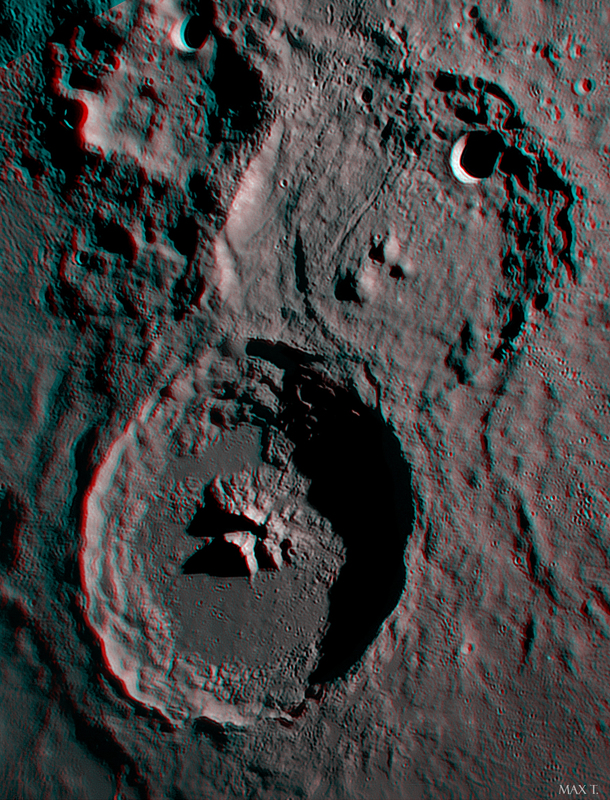 And a 3D Red–Blue image of Theophilus created from the Nov 19 image and another one from September 3, 2015! 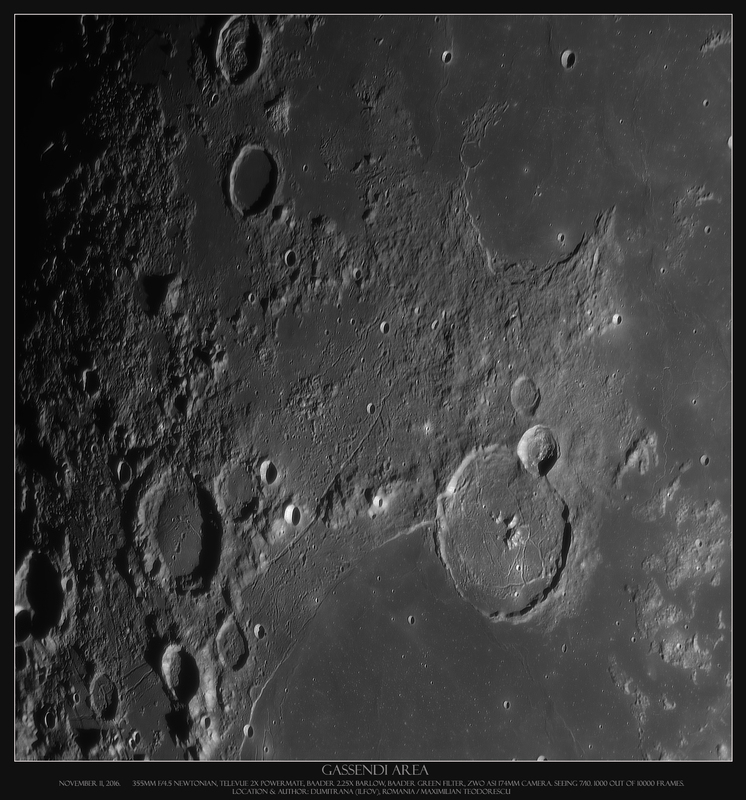 November 18 was a perfect night for HR lunar images: a bit of fog near the ground, no wind, only -5 degrees Celsius and low jet stream. These factors allowed for some near-perfect seeing conditions, with a value of 7/10 most of the time, and 8-9/10 occasionally. The last time I had such conditions was almost a year ago. 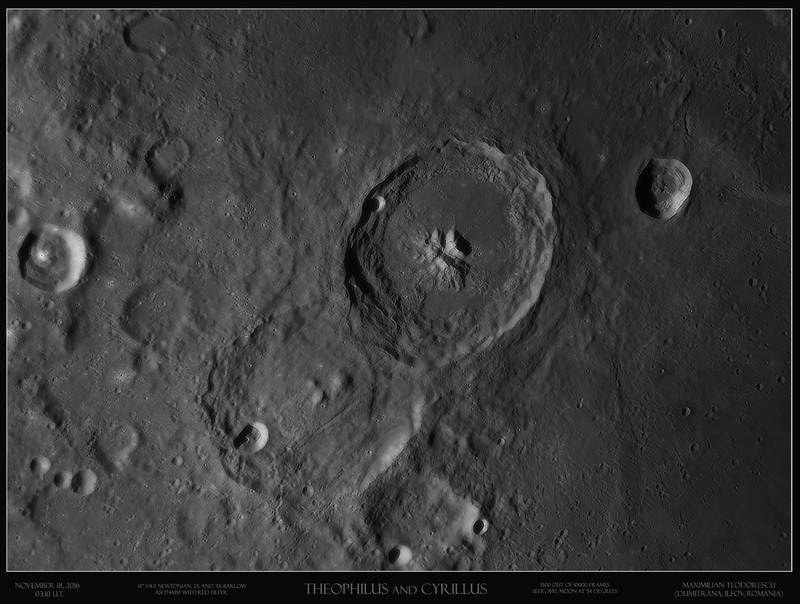 First, one shot with craters Theophilus and Cyrillus being the main subjects. 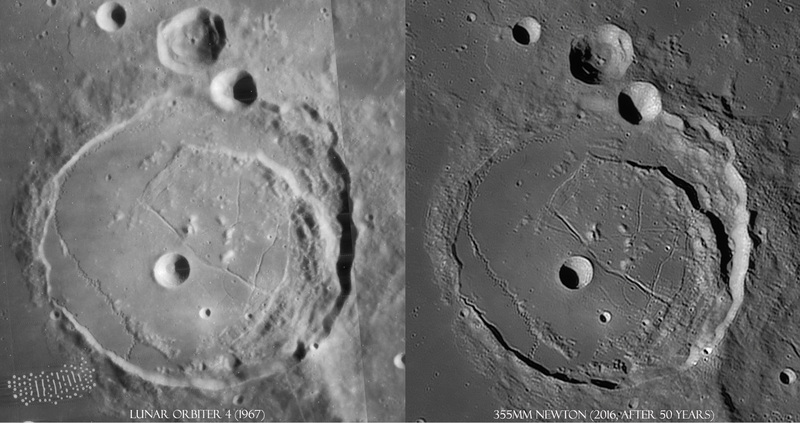 Craters as small as 450-500 meters can be discerned. 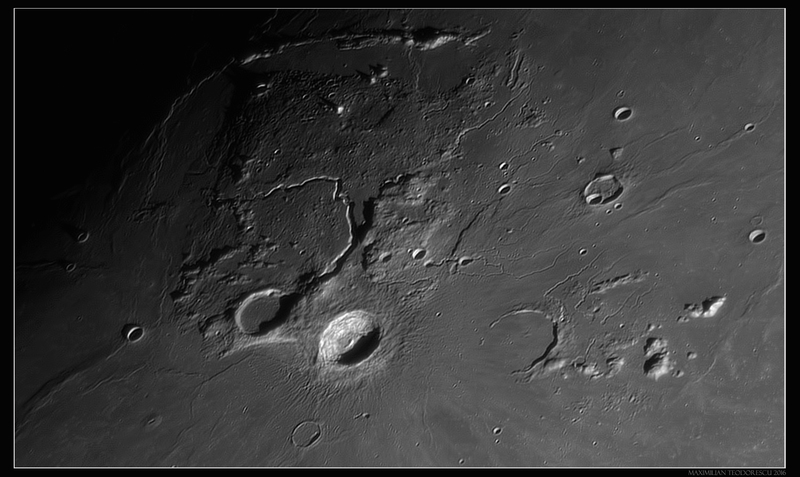 Giant crater Janseen with its inner rimae system, in low-angle illumination and very good to superb seeing conditions. 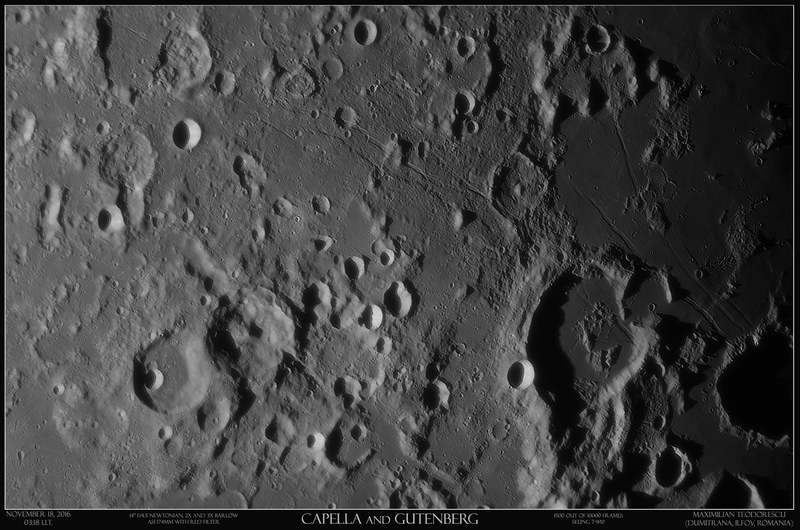 Craters Capella and Gutenberg. 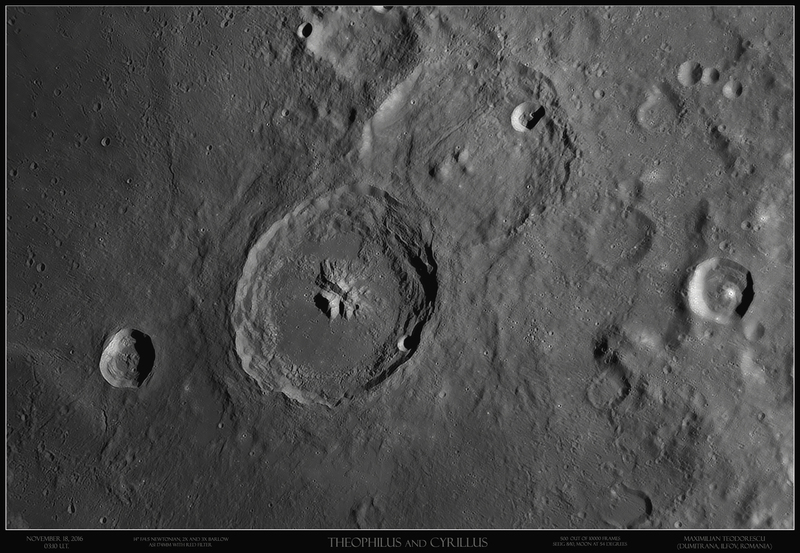 Capella is the strange flower-looking crater left of center, while Gutenberg is the large lava-filled crater right of center. 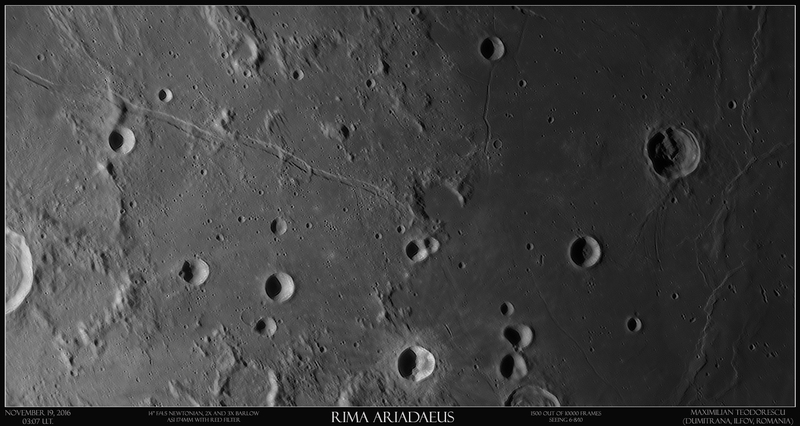 Note the large number of rilles crossing the frame. 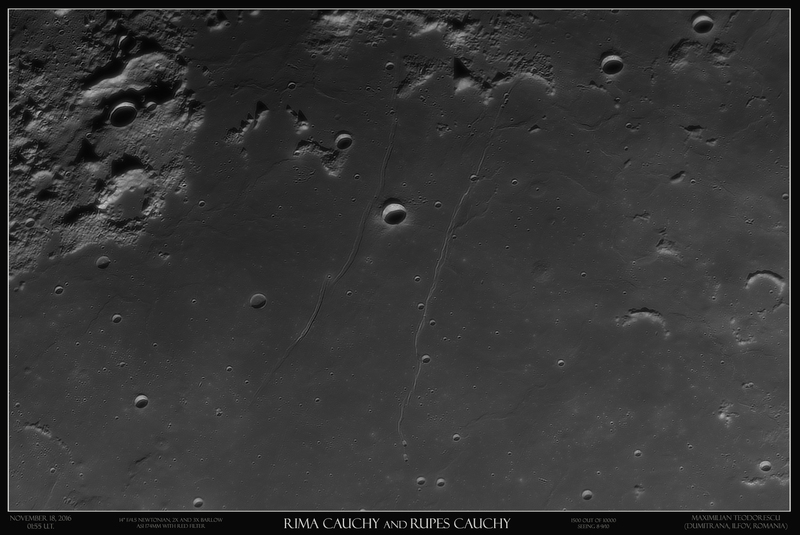 Craters of around 550-600 meters are present in the image. 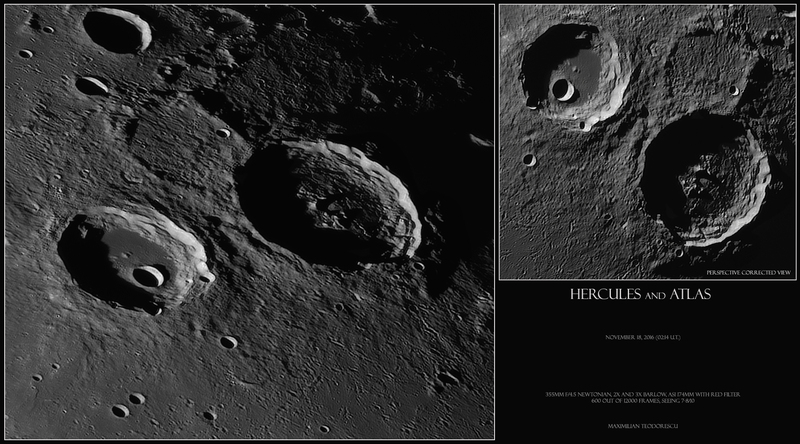 And a Posidonius comparison between the Lunar Orbiter 4 image, back in 1967, and my own from a few days ago. “Only” 50 years were necessary for amateurs back on Earth to get close to the spacecraft resolution from half a century ago. 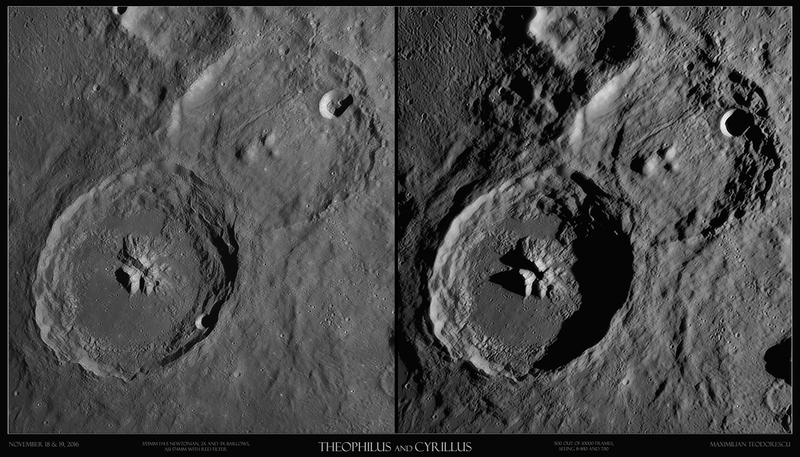 I might still need a few more years to actually get to the same resolution (the LO4 image shows craters of around 260-280 meters), but craters of 400 meters are detectable in my image. 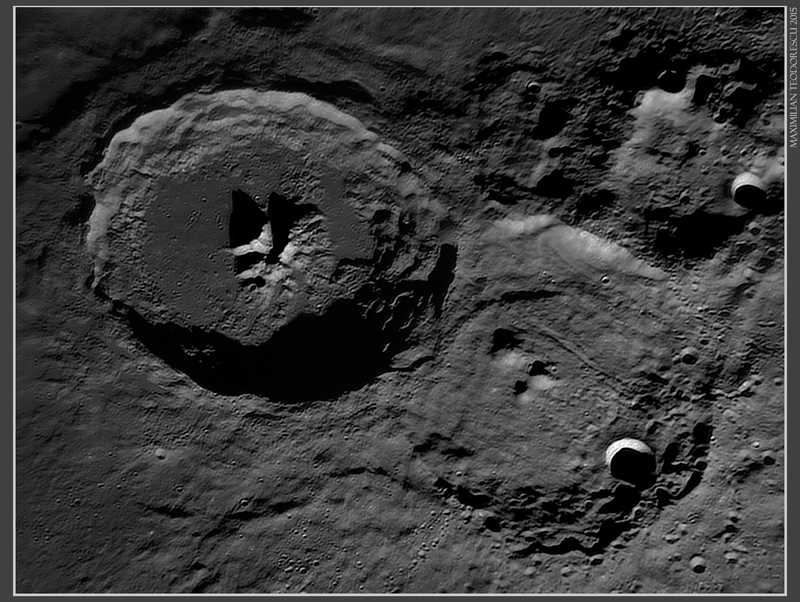 My shot is perspective-corrected to better compare the two views; this type of processing slightly distorts my image, but the smallest details are still there. 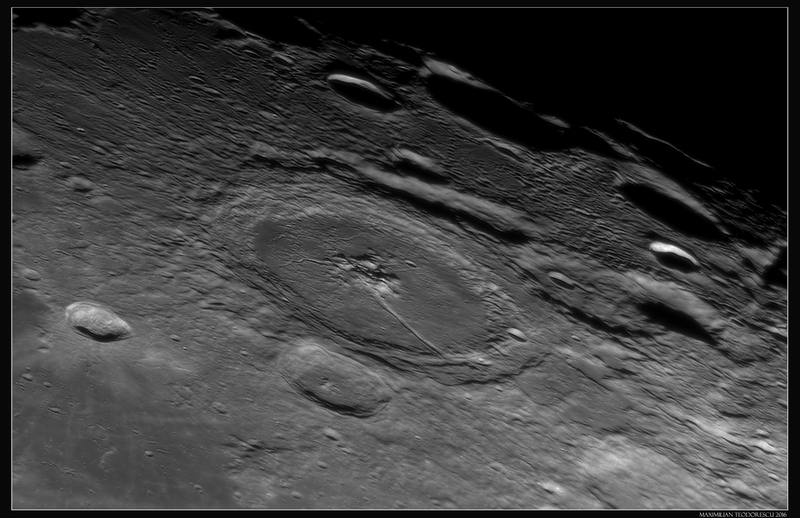 Got another shot at the Moon last night. 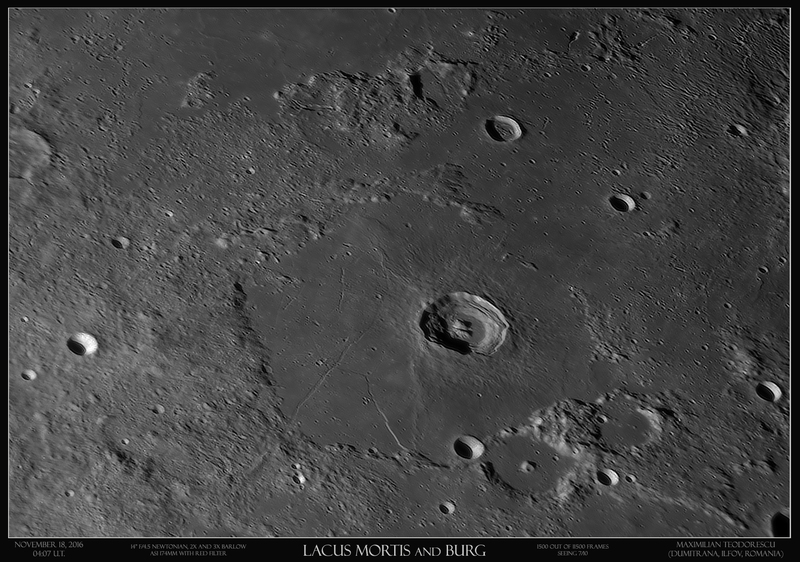 Good seeing conditions, but far from what I was expecting; the local conditions looked very good up until I’ve set up my telescope (low fog, no wind), but after 10 minutes at the eyepiece, the fog dissipated, and a soft breeze started. The seeing continued to be above average, but only rarely got a 6-7/10 value. 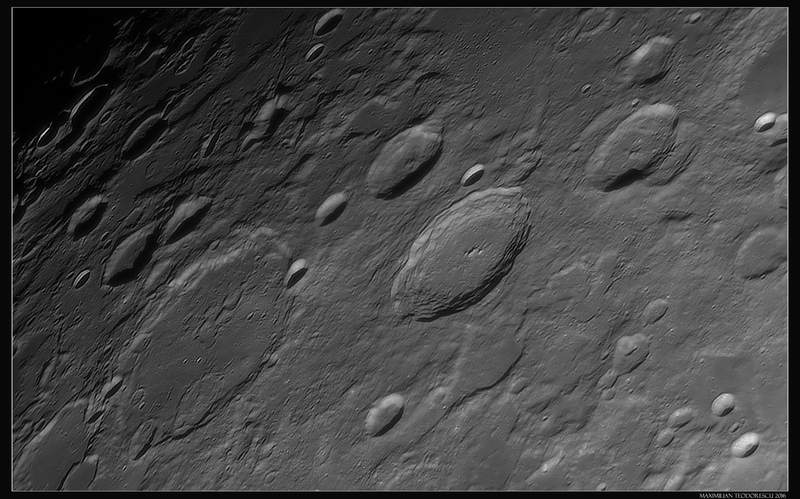 Equipment: 355mm F/4.5 homemade Newtonian, TeleVue 2x Powermate, Baader 2.25x Barlow, Baader Red filter, ASI 174MM camera. 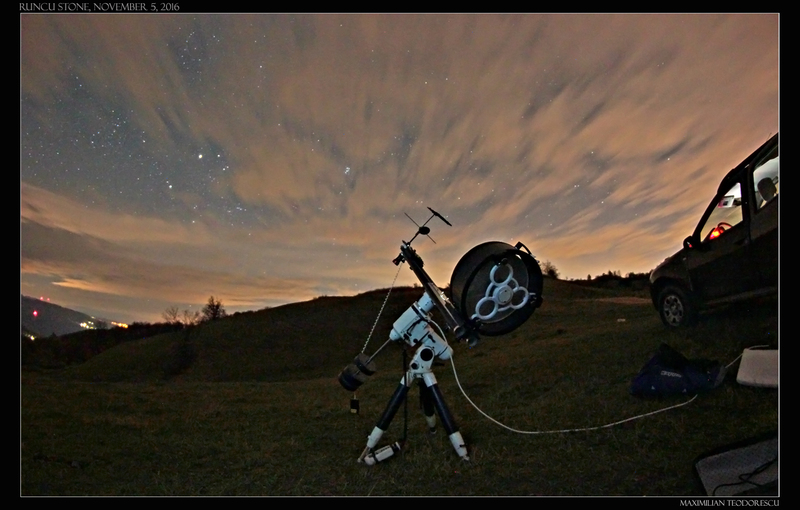 Playing with telescope under extreme conditions (strong wind, low temperatures, pooooor seeing conditions). 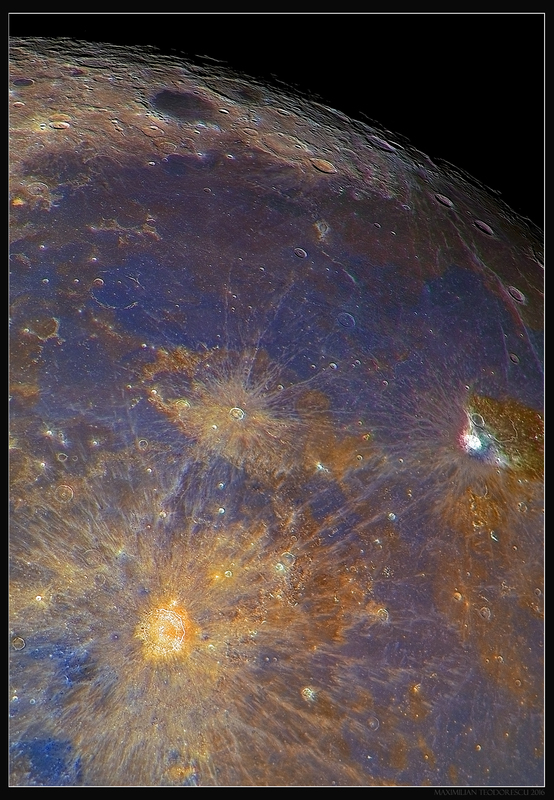 The image shows the colors of the Moon surface, of course highly saturated. 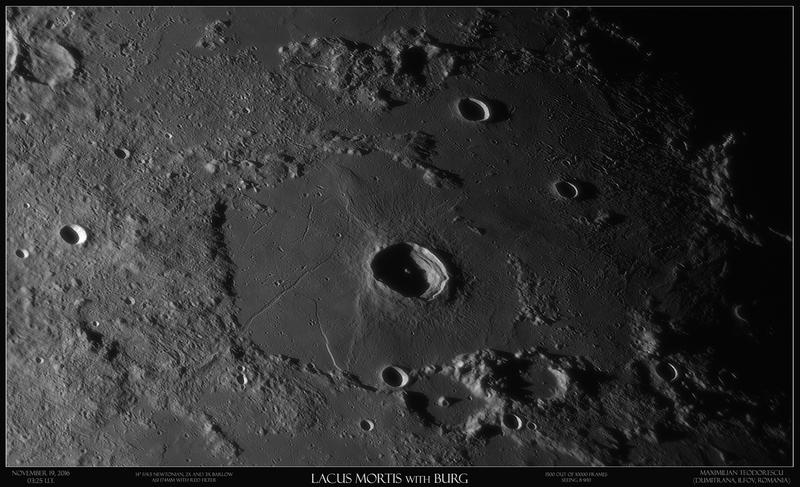 Note the Vallis Schroteri abundance of colors, and Copernicus’s golden hue. 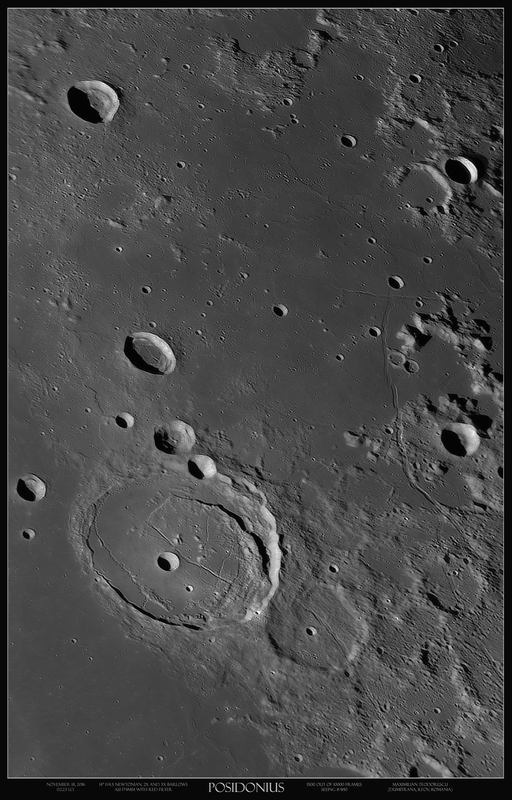 Equipment: 355mm F/4.5 Newtonian, ASI 120MM-S at the focal plane, Baader RGB filters. Seeing 3/10. Strong wind. -1 Celsius. 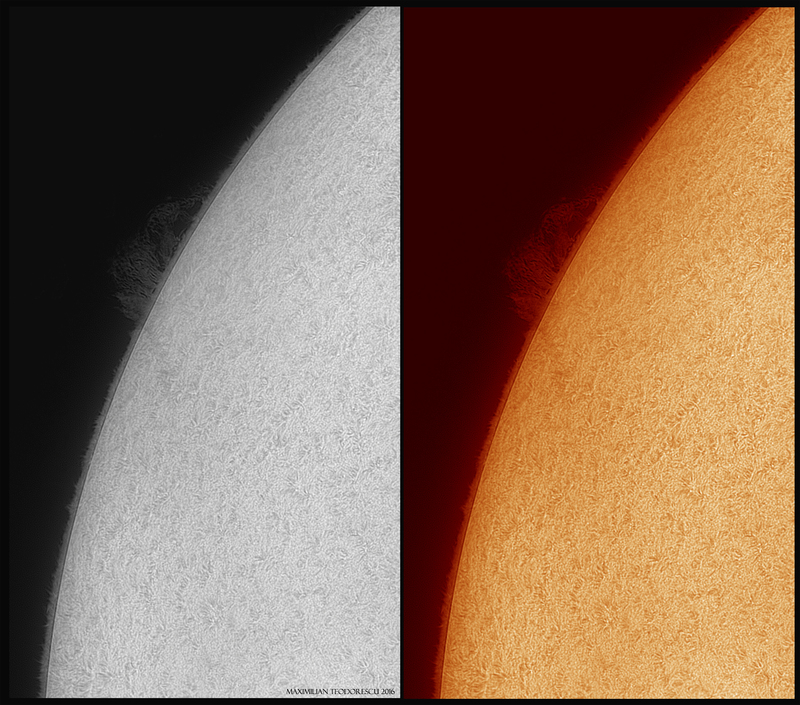 Amazingly for this period of the year, with the Sun hanging at only 27-29 degrees above the horizon, I had a few good seeing moments (for this altitude) for some H-alpha and white light imaging. The equipment: Teleskop Service 115 APO refractor with a Lacerta wedge prism for white light imaging and a 3x barlow, and the Quark chromosphere for the H-alpha images. 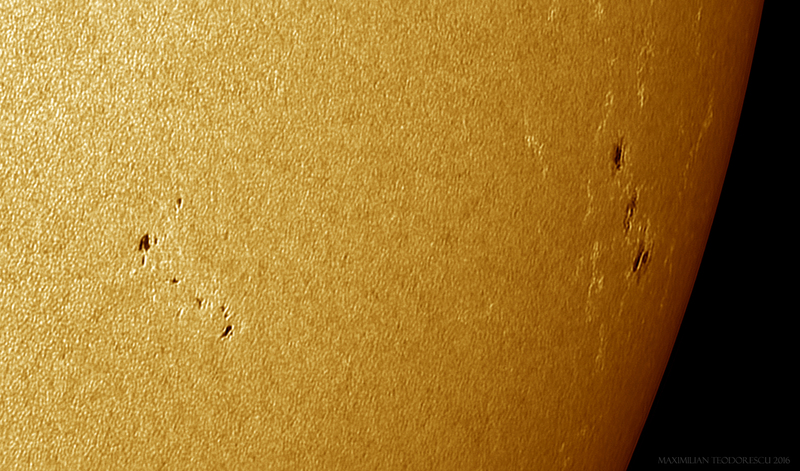 In both situations I’ve used the ASI 174MM camera. 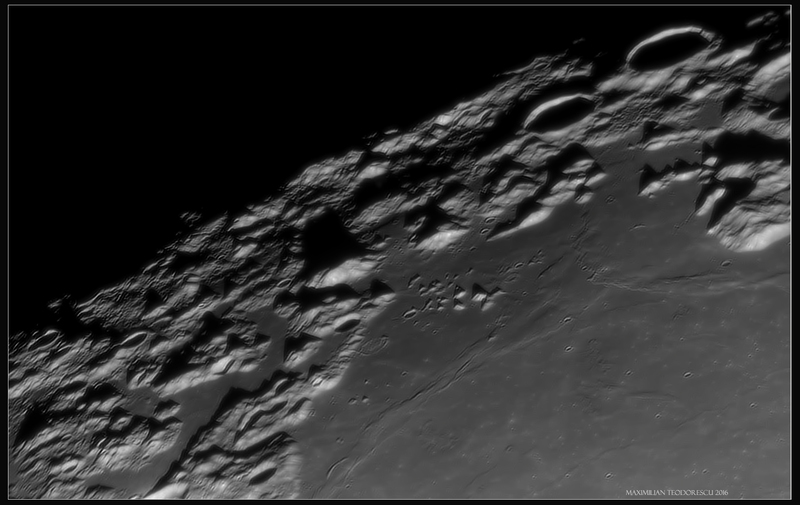 Finally, a nice session with our Moon in good seeing conditions. Not perfect conditions, but for a few tens of seconds the seeing seemed superb. 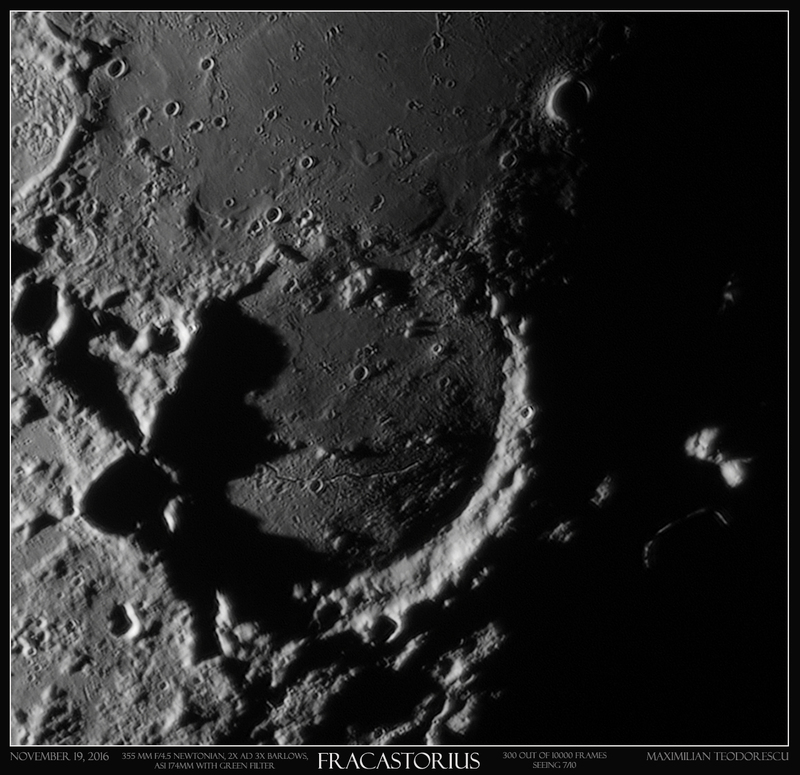 All shots were acquired with the 355mm Newtonian, in 6-7/10 seeing. 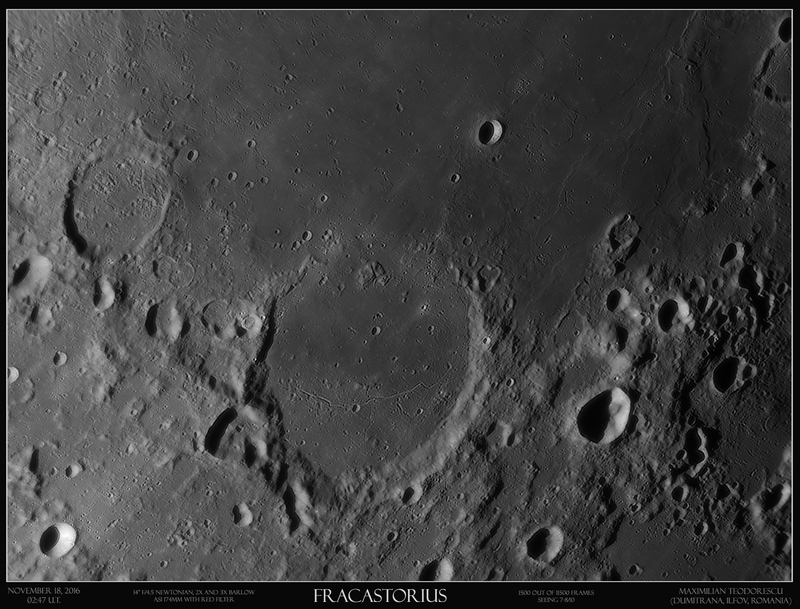 For now, one mosaic showing Gassendi and the surrounding area. 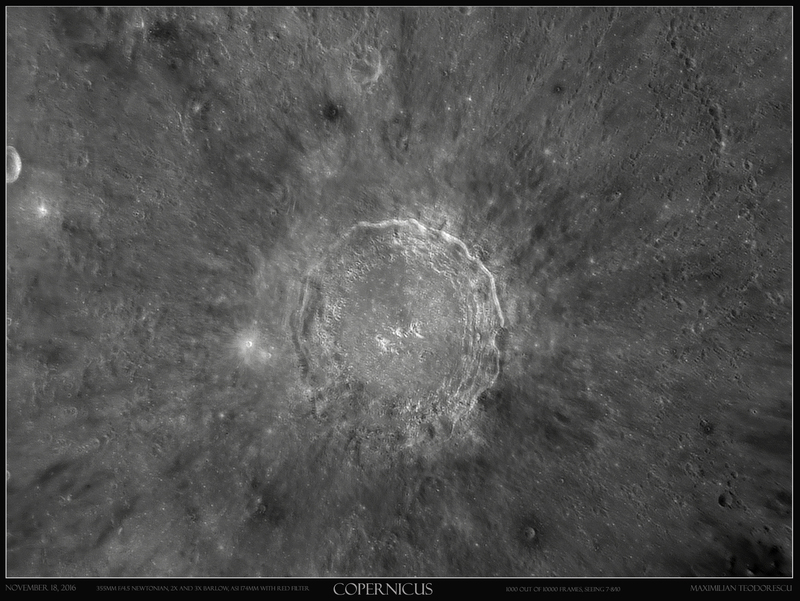 Details of 400-500 meters are observable in the image. I’ve finally went to Runcu Stone, a place with a cabin located at an altitude 850 meters, in Dambovita County, Romania. The sky was clear for almost a full hour, before some cirrus and other “species” of clouds rolled in. The Moon was present also, hanging above the western horizon. Still, the limiting visual magnitude was close to +6, with the Milky Way beautifully crossing the entire sky. 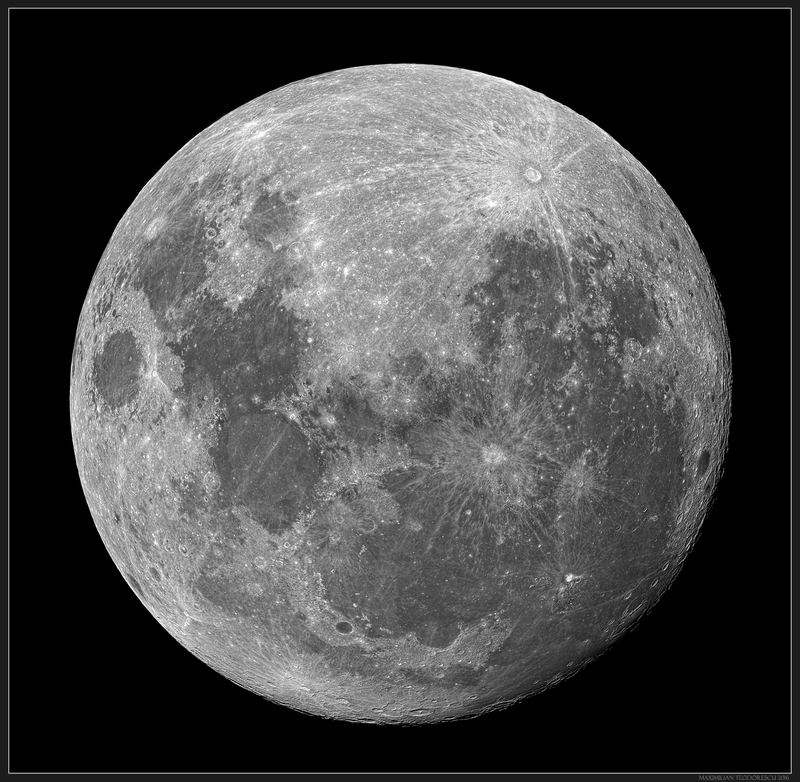 The strange scope in the image above is the 355mm F/4.5 homemade Newtonian. 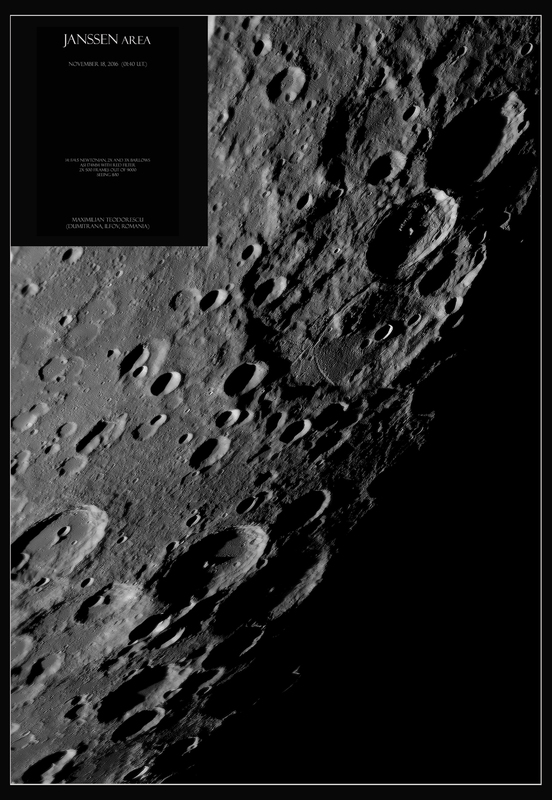 Together with the ASI 174MM camera (with no filter), it formed the imaging setup for the session. 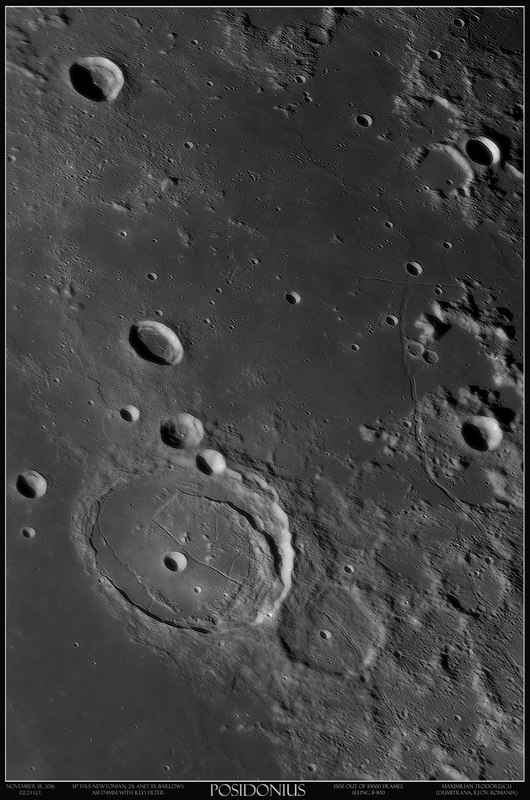 The second and final shot for the night, is an image acquired in very difficult conditions, through clouds, and with the subject at only 20 degrees above the horizon. 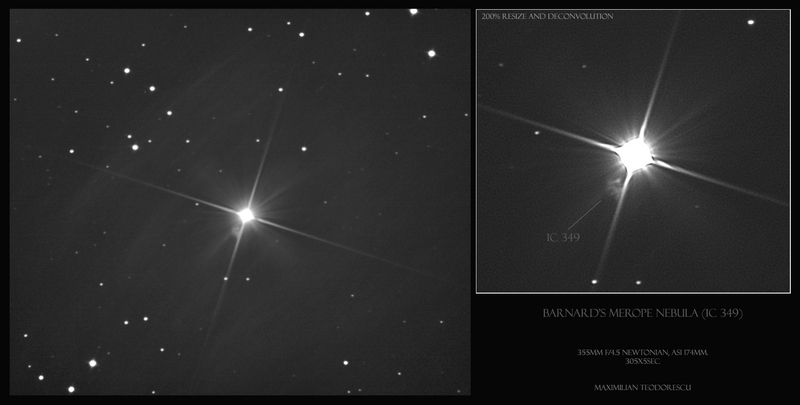 The IC 349 nebula, or Barnard’s Merope Nebula. 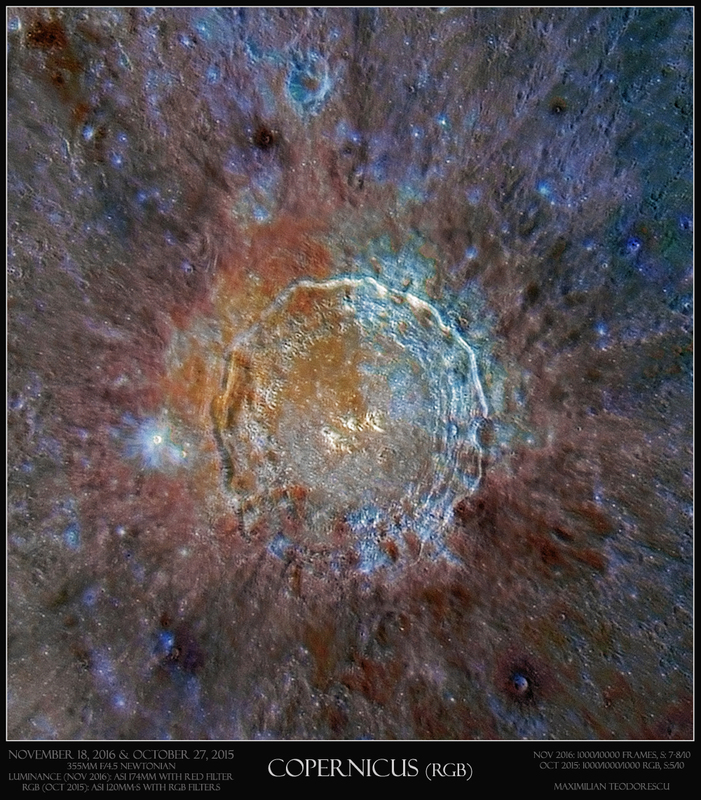 Merope is one of the main stars of the Pleiades (M-45) star-cluster, and it is immersed in the cluster’s nebula. Very close to Merope, at only 36 arc-seconds, there is a small nebula that requires high magnification and large telescopes to be observed or imaged properly due to the brightness of the near-by star. 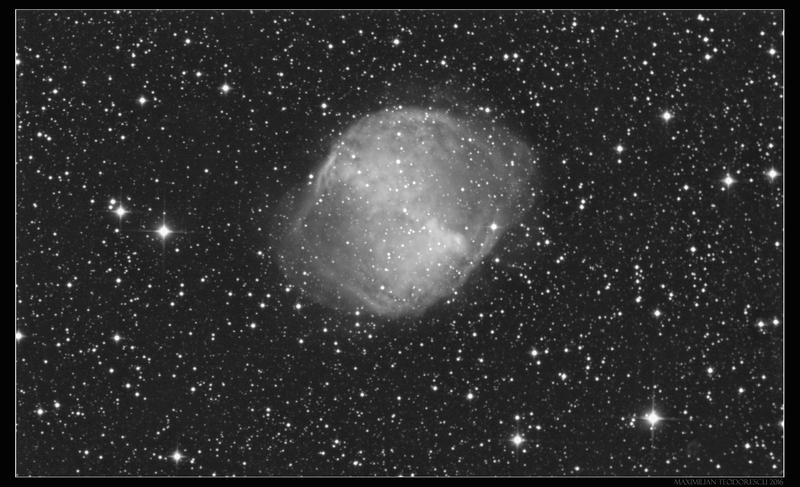 E. Barnard first observed this small nebula in 1890. 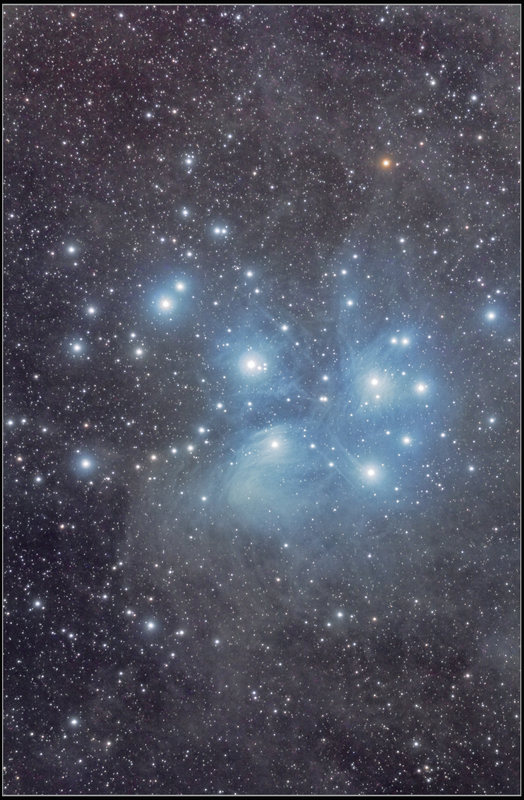 The image below was acquired with the 355mm scope when the cluster was still rising and some cirrus clouds were passing over the Pleiades. Still, some details are visible in the actual nebula.